The disappearing eggshell experiment was a lot of fun. This experiment is part of our edible science series but I personally would not eat these eggs. The kids did not think this one would work at all but were amazed even after 4 hours at how well the vinegar was dissolving the shell of the egg. Follow along if you like and maybe you can do what we didn’t have time to do, throw the shell-less egg and see what happens. Does it bounce or go splat? Which liquid works best dissolving an egg shell? You can use any solutions but we found vinegar works the best. We found that White Vinegar works the best and it was neat to see the egg floating and bubbling as the shell dissolved. The egg that was in the coke also bubbled however I think that is because coke is carbonated. I don’t think even given more time that the coke could eat through the eggs shell. The nail polish remover caused the eggs shell to form bumps. Vinegar contains acidic acid which breaks apart the calcium carbonate molecules. This separates the calcium and carbonates apart and makes the calcium float. The bubbles are the vinegar breaking down the shell. It feels like a bouncy ball but is very fragile. 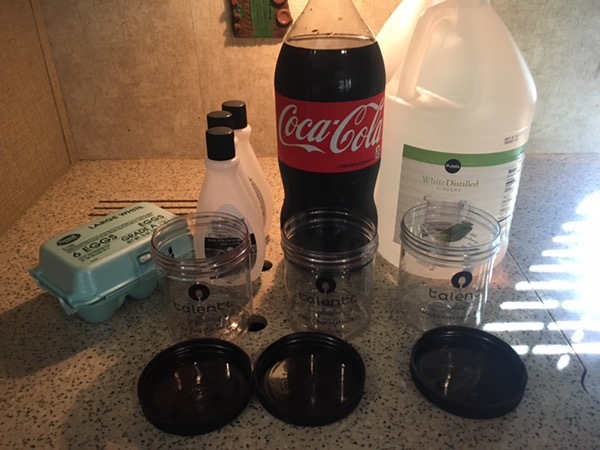 This entry was posted in Edible Science, science, Unschooling and tagged disappearing egg, edible, experiment, science, STEM by Chrissie. Bookmark the permalink.